It’s one of those things you don’t think about until you have to buy it and you have no idea where to start. You want your kitchen bin to be big enough to hold all your waste, but you also want to save space, promote good hygiene, and own a bin that at least looks good on the outside. There’s a kitchen bin for every taste – from small, compact designs, to bins with pedal motion sensors, lids that open and close via touch, and even the good ol’ lift-and-chuck. Soft touch open and close. 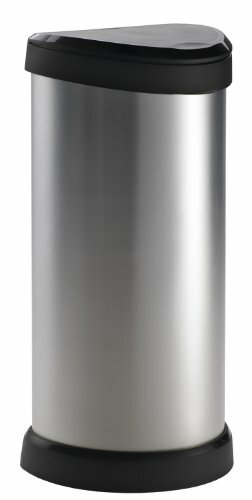 40-litre capacity – The Curver’s size is the perfect fit for your kitchen. Big enough to handle large amounts of waste, small enough not to take up too much space, and common enough to be able to easily purchase refuse a range of suitable bags. Metal effect – it looks like metal, but it’s plastic. The sleek plastic design can look attractive in any kitchen and since it’s plastic, it’s easy to clean with none of the pesky fingerprint issues you would find with a metal bin. The flat edge back allows it to easily stand against the easily, which saves space and keeps the bin a secure, stable position. It’s also very affordable considering the design and capacity. The one touch lid, as convenient as it is, is prone to malfunctioning, which at times stop the bin from opening or closing. However, there is a five-year warranty to replace any damage not caused by you. Slow/cushion close lid – Addis designed the technology, and now they’re perfecting it. The lid still opens hands free as the it functions like the usual pedal bin, but once the pedal is released the cushion close technology muffles the closing of the lid, so there’s no banging our loud sounds. 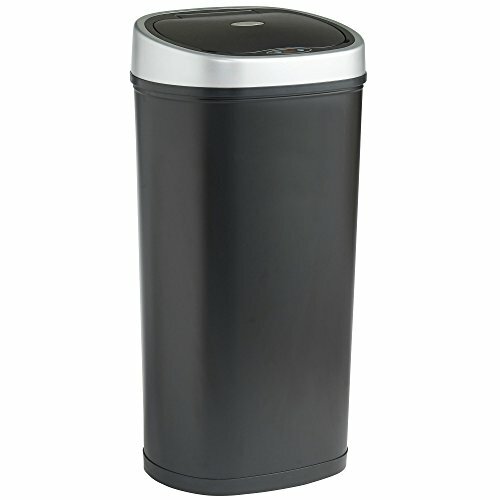 Removable inner bucket –The retro waste bin has a removable inner bucket, making removing waste oh-so-easy. And to clean, simply lift out, wipe down, and insert the bucket back into the base, which, by the way, is non-slip, so your kitchen floor is protected from ugly scratches. 30-litre capacity – The 30-litre capacity might be small for bigger families, but it packs enough size to be suitable for most kitchens, especially because of the sleek, rounded design. It’s a close race between the cushion close lid and removable inner bucket for best feature, but practicality beats out comfort this time. Being able to remove the bin bucket, take out waste (and avoid dropping anything into the container) and then give it a quick wipe-down is a benefit that shouldn’t be understated. 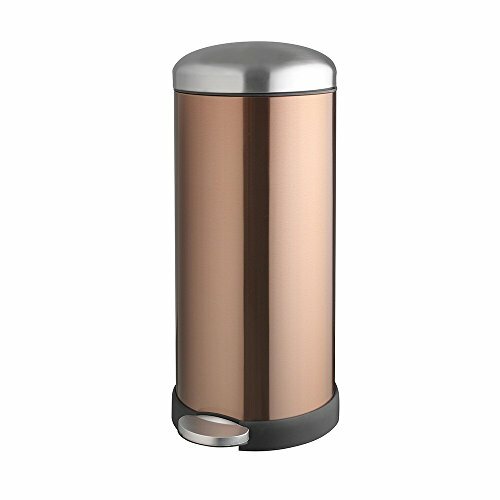 It’s easy to see why this Addis is one of the best pedal bins available. The copper design doesn’t bode well for durability and it tends to dent quite easily. Extra care might need to be taken when removing waste and cleaning the bin. Infrared sensor – Thanks to the LED infrared sensor, the VonHaus Automatic does most of the hard work for you. The sensor eliminates the need for you to use your hands when opening and closing the bin, making the waste disposal process easier and more hygienic. 50-litre capacity -This one is the biggest of the bunch so far, which means it can withhold a pretty decent amount of waste before it needs to be cleaned. The bigger size doesn’t mean that the bin won’t fit in smaller kitchens as the stunning design allows the VonHaus to be a chameleon in any kitchen. Strong and durable – the non-corrosive steel ensures that this bin will be in your kitchen for a long time. And the fingerprint-resistant finish means that even when you need to use your hands, the exterior won’t show the oily fingerprint displays. The VonHaus features a press rig for a tighter grip and bin liners. To remove the liner, simply press the ring again for a fuss-free disposal. This is all makes it one of the best sensor bins available. The bin doesn’t come with batteries, so you need to purchase this on your own. It also appears to use quite a bit of battery power. The batteries need to be changed every three-four months. Space Efficient – Although a 40-litre capacity is on the larger size for a kitchen bin, the slim design of the simplehuman allows it to be a space saver. It can fit into the tight spaces between cupboards, a kitchen table or the sink. 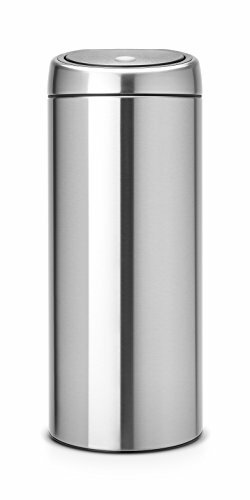 Silent close lid – the patented lid shox technology controls the motion and speed of the lid for a slow, silent close. It combines the best of the traditional pedal with more advanced motion technology. Built-in wheels – the integral wheels make it easy to move and position the bin as needed. Once it’s in place, lock the wheels to make sure it’s there. The lid not only allows you to keep the bin open for as long as you need when you’re busy with kitchen chores but also has a lid lock feature that ensures the lid stays closed, keeping enquiring children and energetic animals out. Although meant to be an advantage, the bin comes with custom fit liners that are tailored to fit the can. This allows the bag to fit perfectly and stay hidden when the lid is closed. However, this limitation could prove inconvenient as specific liners need to be purchased and the usual run-of-the-mill liners won’t fit as snugly. Durable and Robust – The Barbantia Touch is made from corrosion resistant materials, so its able to resist damage from all the elements and it will likely be in your kitchen for a long time. While its resisting exterior damage, it’s also protecting your kitchen floor thanks to the plastic protective rim. Hygienic and easy to clean – Perhaps its best feature, the ventilation holes in the inner bucket allows excess air to escape when the bin liner is being inserted and prevents a vacuum, so the bin is less likely to smell. The inner bucket can also be removed, which takes a lot of the hassle out of cleaning. 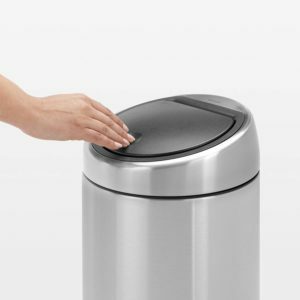 Silent operation soft touch opening – a simple, soft press of the hand on the lid is all it takes to open the bin, and once you’re down, lightly tap again to close. Makes for easy operational use. Moving the Touch Bin when it’s full or if you need to clean around it is easy thanks to the sturdy carrying handle. Although the price has dropped from around £99.99 to £69.99, it’s still quite steep. 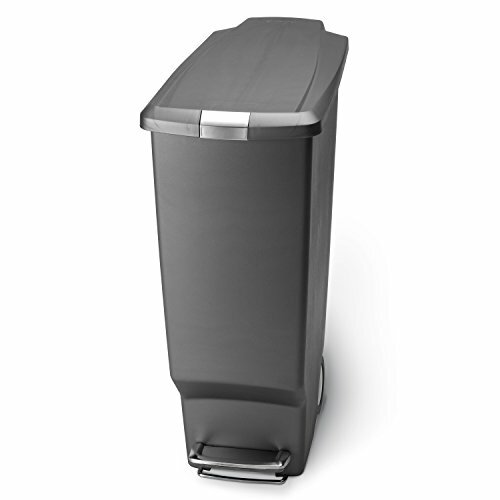 The features are great, but the same features can be found on bins for £20 less. However, you are paying for longevity, and Brabantia is a brand that is known to deliver on its promise. One of the first aspects you need to consider is the size you want and where it will be placed. A smaller bin might take up less space and be less of an eye-sore in your kitchen, but it also means having to remove any waste a least once a day. Decide if you want a small, medium, or large-sized bin. Kitchen bins typically come in sizes from 25 – 50 litres. 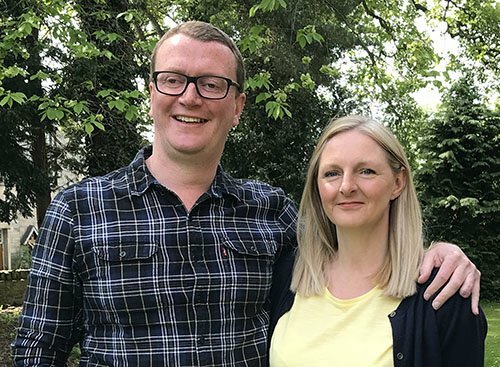 Your bin is going to take a lot of abuse, especially if the whole family is using it. Make sure that whatever you choose, it can withstand constant opening and closing and the depositing of rubbish. The stainless steel vs. plastic bin debate is still ongoing; stainless steel may look sleeker and be stronger, but if its dented it can prove unsightly – plastic bins won’t have this issue. The age of recycling is upon us, and recycling-friendly bins help each of us to do our bit. If you do recycle, then you could consider looking at 3-in-one bins with sections for food, plastic, and glass. If you’re getting an all-in-one bin, make sure that the bin you’re getting is suitable for the type of waste you’ll be depositing. Nobody wants to spend their time removing dirt and dipping hands into a bin to take out and put in plastic bags. Unfortunately, we don’t have a choice, but this doesn’t mean that we can’t buy a bin that makes the process as painless as possible. Removable lids and plastic bag holders are some things you should keep an eye out for.DesignIt might be tempting to get the prettiest looking bin in the row, but when it comes to bins, everything else should be considered first. Stainless steel bins generally go well with any interior aesthetic. Plastic bins also come in sleek, retro, and if you want, plain designs. Your bin should be easy to clean, with crevices that aren’t too small for you to reach. The bin should be properly airtight to stop any smells from coming out.